I walked to the car this morning in the pouring rain and could barely hear myself think for the cacophony of bird song that filled the air. Oh right, it’s spring. That time of year when everything and well, everybody, fluffs up and shows off their colors. In the vineyards this is happening too. Tightly compacted buds formed the previous summer find the perfect ratio of temperature and daylight (called degree days) and before you know it, they’re bursting forth in a mighty push of leaves and flower clusters destined to be our next vintage. The process is much like a telescoping wand and it never fails to amaze me how quickly it all happens. A few points of interest regarding grapevines: first of all propagation needs neither bee nor birdsong as the vines are self- pollinating and secondly, the flowers on a vine are so miniscule as to go virtually unnoticed by even careful observer. The showy peach blossoms down the road at Dry Creek Peach and Produce will provide the best flower you can find in the valley but the lowly grapevine blooms, well, they're a yawn. 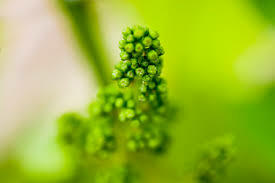 Soon after the flowering cycle, small bb-sized grapes appear all in green, no matter that vine produces red or green grapes they all start this way. The transition of color for red grapes, called veraison, occurs around mid-July. The spring season in the vineyard requires many activities. That beautiful crop of mustard and legumes that grew between the rows during the winter must be disked into the soil to create a vital nutrient package which encourages the greening of leaves and lightening of soil. The vines must also be trained on their cordons and require the studied hand of the vineyard worker to maintain the fruiting line of the vine. There are many types of trellising to be found in the vineyard and it’s fun while driving down Dry Creek Road to name the different styles you see. Overall, the vineyard is a dynamic growing place and vineyard managers and growers alike look to keep all things in balance so that fruit and canopy are proportionate to root systems and particularly this year, to irrigation strategies. 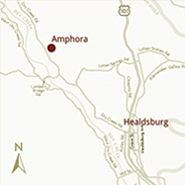 If all goes well, the harvest will produce a vintage unique to all others, created by the conditions of the particular year, the craft of farmer, and the art of the winemaker. Each element will be reflected in that amazing bottle you’ll drink to toast the awakening of a future Spring.